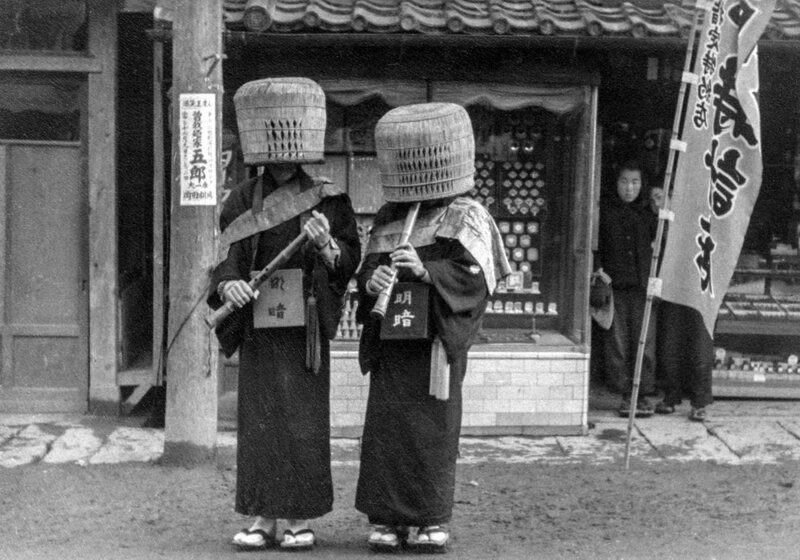 These are two komuso [mendicant priests of the Fuke sect of Zen Buddhism] standing at the front of Hondatokeiten Clock Shop, which used to be on Ishinomaki’s Nakamachidori Street (in Chuo Nichome). This was an old shop that opened in 1895 (Meiji 28) after the Sino-Japanese War, but it sustained heavy damage in the Great East Japan Earthquake and went out of business. I felt like I had seen this before- when I saw the symmetry on the left and right of the store windows I remembered and confirmed that it was the same store from a different photo. The entrance is at the center. It had three glass doors and was 1.5 ken [approximately 9 feet]. Komuso were temporarily done away with in the Meiji Period [1868-1912], but they came back in the form of the Myoan Church. They appear in historical novels and movies, for example “Secret of Naruto.” When this author was a child he saw them standing in front of stores playing shakuhachi flutes and receiving offerings in their meian boxes. In the Edo Period stipulations [for the komuso] were established regarding things like personal effects, religious mendicancy outfits, and preparations for travel. Because samurai who committed crimes could become Fuke Sect priests, escape punishment, and be protected it is said that that ruffian false komuso were rampant. In 1871 (Meiji 4), the government issued an edict that prohibited the religious activities of the Fuke Sect; however, in 1888 (Meiji 21) the Myoan Church was established in Kyoto and the pilgrimages of the komuso were revived. The image of a meian box hanging down from the neck comes from this time onwards. 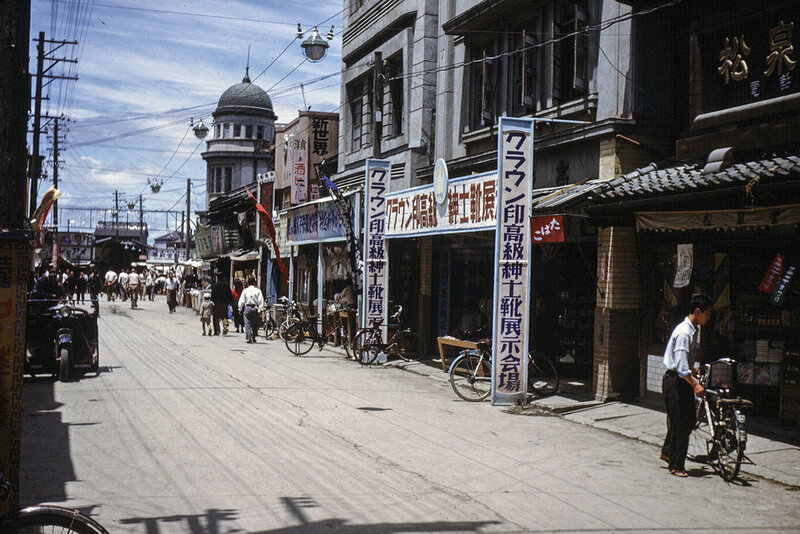 This is a photo of Naikaibashidori Street in Nakase which had gotten back up on its feet after the building removals in July of 1945 (Showa 20). ‘Building removals’ refers to the obligatory demolition of residential buildings and such with the goal of creating anti-fire rings in order to protect important establishments from fires caused by air raids. From the left we can see Chibamishoten, Yokotatabakotsuriguten Tobacco and Fishing Supply Store, and the Yamanishi Firm; beside the telephone pole is the hill road that continues on to the northern end of Akiba Shrine. There were also shops in that area (is that one house the Kawasakitokeiten Clock Shop? ), and one house can be seen in the harbor in the direction of eastern Naikaibashi. The brand-new glass door on Chibamishoten indicates its recent reconstruction. On the right is the Okuda Theatre’s film board (title unknown). The Okuda Theatre, which was rebuilt after the war, changed its front from kabuki-style seating to a one-story style, and became a movie theatre in 1949 (Showa 24). The record-breaking hit, Godzilla, was screened in 1954 (Showa 29). A wagon on Nakasedori Street is heading towards Minato. It’s not entirely clear what the cargo is, but because lots of furniture that look like tansu or other large chests has been loaded onto the cart, maybe they’re moving? The luggage has been wrapped in woven and rush mats to prevent injury. The coach frame is made of wood, a small front wheel, large back wheels, and a luggage platform. It was a revolving framework that made use of slight rotations of the front wheel. Before long wagons became fewer and were superseded by automatic three-wheeled cars and automobiles, but horses were still used by farmers picking up septic tanks they had requested, wood and fuel transport, and pulling sleighs for timber felled in mountain forests. The present day Jogawa River (17km long) flows through the old Kyukanancho and Kyuyamotocho neighborhoods and fills up the Ishinomaki Port. Until the early days of the Meiji Period, because they originated from Araodake Mountain in Osaki City’s Naruko hot springs town in the Tamatsukurigun District there were rivers named things like Tamatsukurigawa, Araogawa, Eaigawa, or the Teruigawa River (which was named after a lord) that poured directly into the sea through the Omagari coast. After Shigeyoshi Kawamuramagobe joined together the Eaigawa, Hasamagawa, and the Kitakamigawa rivers in 1616, because the water source was cut off in the old Kyukanancho Tatsunokuchi neighborhood the river was afterwards called the Jogawa River. The Jogawa River, which flows across flat land, has at high tide an upstream flow of salt water. The masses of reeds that can be seen growing on either bank show how the brackish waters of mixing fresh and salt water cultivate the reeds in the slow-flowing river. Along the Jogawa River at night there were also places where the work horses that labored all day long could wash themselves. Because [this author’s] mother’s family home was in front of the river in Minamiakai, he often went to the Jogawa River, but has a strange memory of wondering what those little huts on the water’s surface were. Before long he figured out that they were dipping net huts for catching river fish. Dipping nets were square, bag-like nets onto which one would attach bait, that would be submerged under the water, and that would lure in the fish. Fishermen would look out from the huts for the fish to enter the net, and as this fishing gear would be lifted up the moment the fish entered it was one type of lift net. Using the same fishing methods on the Kitakamigawa River basin’s Hasamagawa and Narusegawa Rivers fishermen would aim for fish like koi, crucian carp, and catfish; in brackish waters they would aim for dotted gizzard shad [also called spotted sardines], small goby, or chum salmon that had returned to where they were born in the Kitakamigawa River around the prefectural border. In the 50’s of the Showa Period [1975-1985] dipping nets for whitebait fishing could be seen around Mangokuura. These are three rickshaws, used for carrying passengers, and their drivers in the plaza in front of Ishinomaki Station on the Senseki Line. We can see in the photo things like, on the right hand side, the old Shimizushokudo restaurant on the corner of the road in front of the station, towards the front what would later become Kasugachodori Road, and the three white bulbs of the suzuran streetlights that were installed by volunteers in front of the station in 1950 (Showa 25). Seeing the unpaved plaza in front of the station is a vivid reminder of the wooden station built in the Miyagi Electric Railroad Era which began in 1928 (Showa 3). The rickshaw driver’s clothes seem to be a hat halfway between a military hat and an ordinary cap, a military jacket and pants, a towel around his neck, and a pair of split-toed work tabi. The picture shows the poverty of postwar Japan, a time of suffering when things were in short supply. The rickshaw is a vehicle invented by a Japanese person in the early years of the Meiji period [1868-1912] and was brought in to Ishinomaki as well. Looking back, there were rickshaw and stage coaches running in between Ishinomaki and Matsushima for people who were going to the capital. Looking at a 1927 (Showa 2) telephone book, one will see “Naikai Rickshaw”; they were used for picking up house call doctors, geishas, and masters. This author who was born after the war has of course never ridden in one, neither has he ever seen one carrying passengers around. 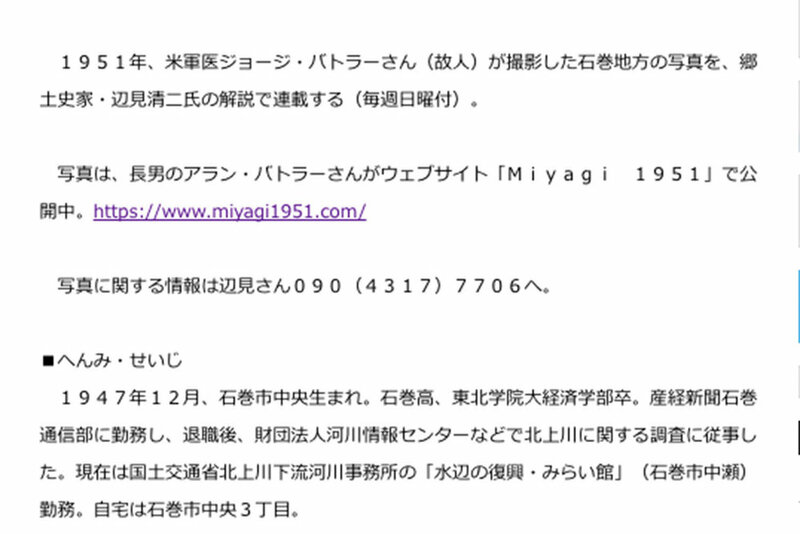 If anyone knows, please let us know until when rickshaws were used in Ishinomaki. 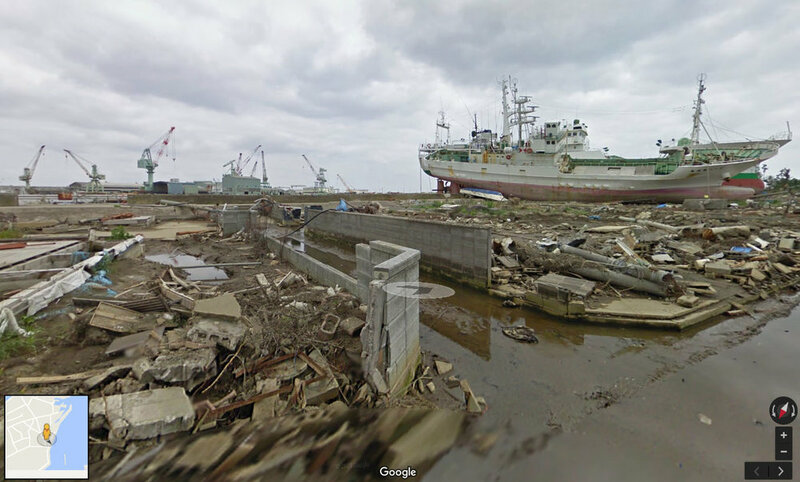 In July of this year , shocking news came to Ishinomaki. Nineteen Japanese people who had not yet heard of Japan’s defeat were rescued from Anatahan Island in the Mariana archipelago and returned home. Within those nineteen people were the healthy captain of the navy-conscripted Kaihomaru no. 7, Katsusaburou Shirai, chief engineer Azuma Kumagai, and crewmember Sueji Kimura. This author remembers the Tanshobo book store on Omachidori (his route to school) and the Kinkodoshoten book store (formerly the Suzukishoten book store) on the south side of the road. The large signboard reading “Lady’s Living” and the banners in the photo really give the store some impact. “Lady’s Living” was launched in May of 1947 (Showa 22) and was followed by pioneer womens’ magazines like “Housewife and Life” in 1951, “The Housewife’s Friend” in 1952, and “Lady’s Club.” They made an effort at advertising like through the burden of creating a signboard, and apparently it had a tremendous impact on publicity. Speaking of stores where a child could go by him or herself, within the town there were a few like Tanakoya or Tosukeya, the Omochaya toy store, the book-lending shop, or the stationary store, but parents would accompany children to the Marumitsu department store, the movie theatre and the hire boat spot, and the roller skating rink. The bookstore therein was a shop you could stop at by yourself. Both bookstores had narrow fronts but went far back, and were laid out in a configuration where bookshelves encircled a center island. The store was poorly lit and had dirt floors. I remember the payment area being towards the back. I probably felt that the store was so big because I was small. The postwar juvenile magazine “Elementary School __ Grader” was reissued in 1946 (Showa 21), and was followed in quick succession by new publications like “Manga Boys” in ’47, “The Adventure King” in ’49, “The Girl Student’s Friend” in ’50, “Good Friends” in ’54, “Ribbon” in ’55, “Boy’s Magazine Weekly” and “We Are the Boys Club” in ’60. Special editions of monthly magazines was also something everyone enjoyed. I couldn’t buy them with my own money, but it was worth it to just look at the magazines. I'd read while standing, flipping through the pages, just looking. Kinkodo moved from Omachi to Tachimachodori Street. At the corner of Tachimachi and the road in front of the station there was a Yamatoshoten book store, so I would read a bit at one store then move to the next and read a bit more until I had finished the story. With Toriyajinja Shrine on the peak of urban Ishinomaki’s Mt. Haguro to the viewer’s back, this picture looks out towards Mt. Hiyori and the mouth of the Kyukitakamigawa River. This photo was taken around the large lantern in front of the shrine grounds and near the front stairs. If you look out southwards from the 49-meters-tall Mt. Haguro, Mt. Hiyori (61 meters tall) acts as a wall and blocks off part of the view. Just in front are over-crowded, fully grown cherry blossom trees. They were probably planted before the war. We can also see buildings like the old Kyuishinomakishiyakusho city hall (a two story wooden building) which burned down in a fire in 1956 (Showa 31) and the old Monouoshika office and education center which was on the other side of the road and also a wooden building. More buildings were being constructed on the Monomizaka hill on the east side of the old town hall and on the hill to the west in front of Kaimonji Temple; the conversion to residential land continued on. The creation of residential lots in Umegaoka and the beginning of the real estate sales happened afterwards. Shops and shipbuilding factories stood in a row down the Nakamachi, Honmachi, and Kadonowakicho riverside neighborhoods. 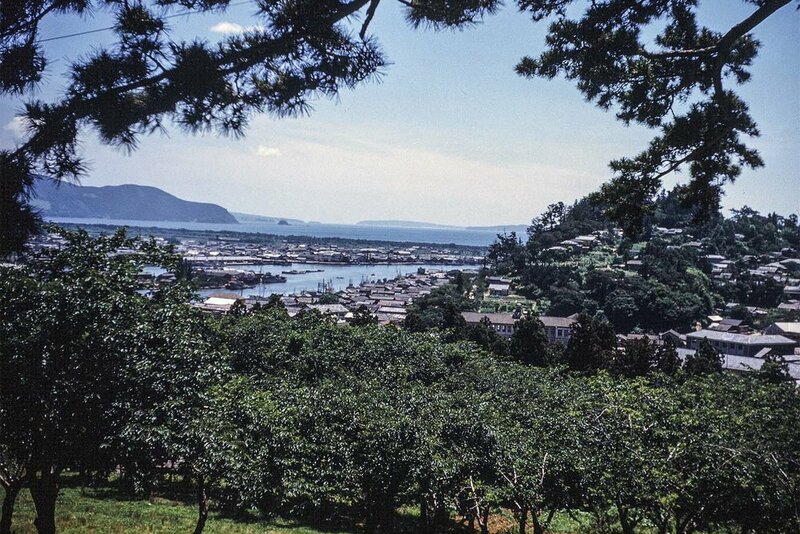 We have a glimpse through the shade of the trees of the activity in Nakase (a shipyard). In 1951 (Showa 26) with the designation of Ishinomaki as a Category 3 Fishing Port, harbor maintenance progressed onwards. In the Minato area on the opposite shore we can see the long roof of the fish market and the completed pier. The dredger permanently stationed in the port at this time continued dredging as it had every year in order to maintain the water depths of the boat routes and estuary. Before long the change to larger size fishing vessels continued, and through seeing the spreading and resumption of fishing industries moving from offshore to deep sea and northern-sea fisheries, we see the development of the fishing industries. The estuary port was reaching its limit, and in 1974 (Showa 49) the Ishinomaki port moved to Nagahama. The school gate of the Ishinomaki Elementary faced the road in front of the old Kyuishinomaki Town Hall that was built in 1917 (Taisho 6). The main and secondary gates were made up of four white granite poles, and if you entered the school grounds on the right-hand side towards the back was playground equipment. In the picture, the children are gathered around a “swinging pole.” Many remember the nearby jungle gym and slide, and the horizontal bars in the front of the school. You won’t notice the swinging pole there anymore. Since there were chains fixed to the props on both ends of the thick log, it was a toy that hung horizontally and would graze the surface of the ground. It could be enjoyed like a swing swaying forwards and backwards. The log that the kids would sit on was quite large so several children could ride at the same time. There was no place to grab onto the log, so it was difficult for the younger children to not fall off if someone shook it. With envious eyes they watched the skilled older children. One day, the log toy was suddenly dismantled and disappeared. Maybe it was taken down during regular maintenance? Behind the log toy is the newly built Ishinomaki community center, and there is a long stairwell stretching down from the second-floor emergency exit. Because of an official notice from the national government, in June of 1947 (Showa 22) the community center leased the second floor of the Kankeimarushoten store on Omachidori Street and reopened. In June of 1949 at the site of the old Kyuishinomaki Town Hall in Yatsuzawa (currently Yatsuzawakoen Park) a new wooden mortar, two story building was constructed and the community center reopened there as the first independent community center in the prefecture. This writer, a graduate of Ishinomaki Elementary, would take a field trip after school and stop by to visit the different exhibitions. This community center is filled with memories of walking around the building with shoes still on. 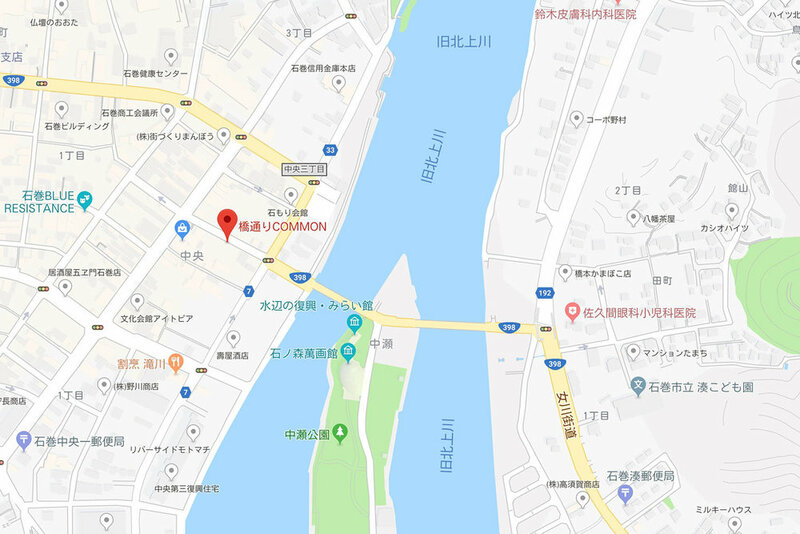 Kimpira street, where Satomi head office and Mikiya head office used to be, connects the former back town (Omachi) street with the former Nakamachi Street, the river bank of the former Kitakami River. The street history dates back to the Edo era and was called "Yagiya Dingo" on the way to Ishinomaki Nakamachi and "Minamura Tamachi / Honmachi" on the other side of the former Kitakami River on the way to "Nakamachi". When the Utsumi bridge came over in the Meiji era, when a fish market opened in Nakase, fresh fish traders and Kamaboko (Kamaboko) traders gathered, and the Ishinomaki's kitchen as Ishinami Town · boiled town with "Sarukoya side street" It will be a town to cover. In March 1951, Mr. Kiyosaku Kikuchi in the town became the promoter and worshiped Shinko's Kaneda Rira (Shrine) Shrine, and in the residence on the south side of the street Kim Dora Shrine (Ishinomaki Small old former worship residence reuse) established. We will revise the street name with the approval of the town and neighborhood. The luxurious gate at the entrance to the street was established in early April. 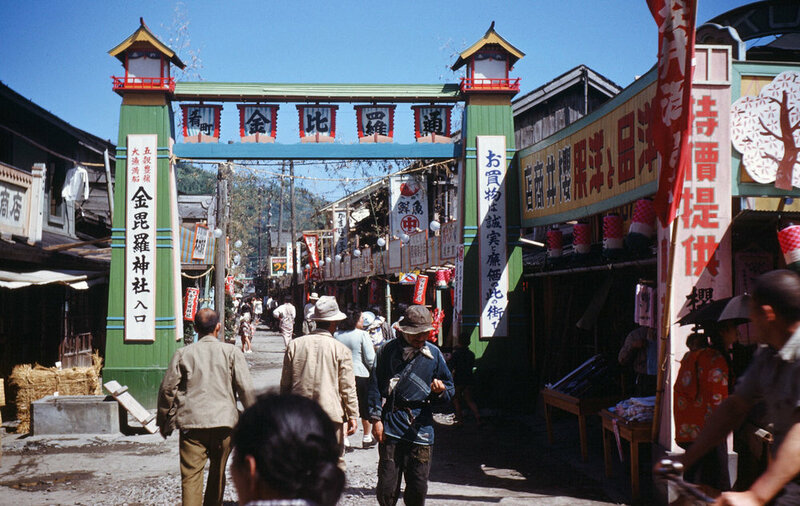 The upper line is "Shinshan Kanpira-dori", the pillars on both sides are read as "entrance to Gala Dragon shrine full of fruitful harvest", "Shopping is in this city of sincere and inexpensive", expectation to the new town name, spirit You can feel it. Sakurai clothing store on the right side of the entrance, Chrysanthu shop on the fresh fish character, "Kimura shop" on the left (after furniture store). The concrete well below the left gate is the old well well known in the old backyard. In the Boshin war, former shogunate army soldiers who missed Enomoto fleet headed to Hakodate were executed by the new government forces. In the vicinity of this well, there is a sad history that became the place of the two prisoners' heads of the city along with the Hijokoji high-bid place. Information on photographs, please contact Mr. Homemi 090 (4317) 7706. The Ishinomaki Harbor construction utilizing the Kama region inlet began in 1961 (Showa 36) and was completed in 1967 (Showa 42). The estuary scenery of the inlet being filled by the Jogawa River completely changed. The photograph is a view of grandchildren and an old woman carrying small fish on Omagari Beach which faces the inlet. The two in the foreground have stuck an oar, as though it were a carrying pole, through a bamboo basket and a tin bucket with fish, shouldered it, and are moving. In the background can be seen the figure of a young woman holding a bucket or something. The Omagari Beach coastal levees (breakwater embankments) appear low, but if you ask Kama residents who know about the old Omagari Beach they will tell you that’s right; this [picture] shows the contrast of the pine trees that had grown tall. 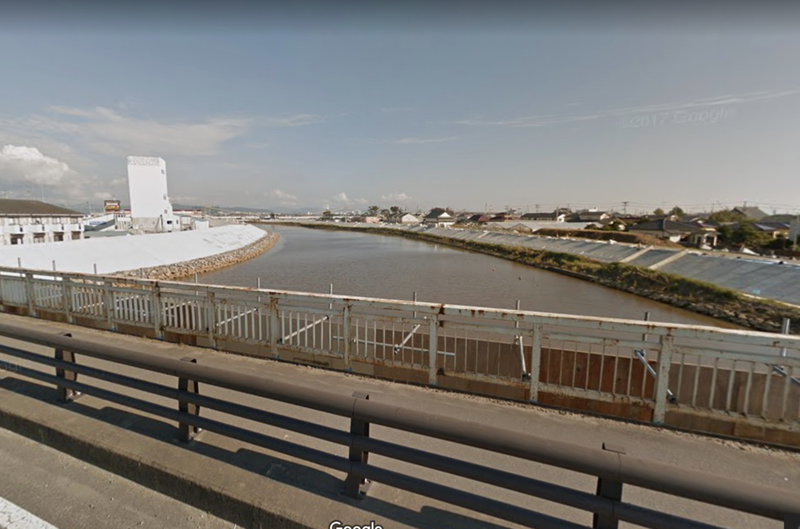 The water in the background is the inlet in Kadonowaki in Kama, and the middle of the Jogawa River filling the inlet was the border between Ishinomaki City and the old Kyuyamotocho Town. The Kamanowatashi Ferry used to come and go here, carrying shoppers and peddlers by boat towards Ishinomaki. Omagari was a prosperous district for the salt-making and fishing industries. As a gift from Mr. Kawamuramagobe, Kamaomagari (an exclave of Omagari Beach) within Kadonowaki was incorporated into Kadonowakimura Village from Omagarimura Village as the Kama region. The region’s name, Kama, comes from the [Japanese word for] pot used in salt-making. This picture is of the neighborhood on the north side in front of Kankeimarumototen on Omachidori Street (currently Aitopia). It can be seen from the clothing of the passersby that it was either spring or autumn time. Captain Butler stood in this spot and took several photos. One can see that the shops on the west side of the street are Tokyoyahakimonoten shoe store, the stallholders in tents pitched in the empty lot in front of the Ishinomaki Chamber of Commerce and Industry, Hamayayohinten Western goods, and Kameshichigofukuten Japanese cloth store. On both sides of the street are a forest of banners, and if one looks at the end of the street he will see all of the people in front of the street stalls; it is surprising to see so many pedestrians here. To the North side of Tokyoya[hakimonoten] are the Ishidakanamonoten hardware, Marunao, Somayakaguten furniture, Kankeimarushoten, Sutoaramonoya variety, and Tanshobo shops, etc. 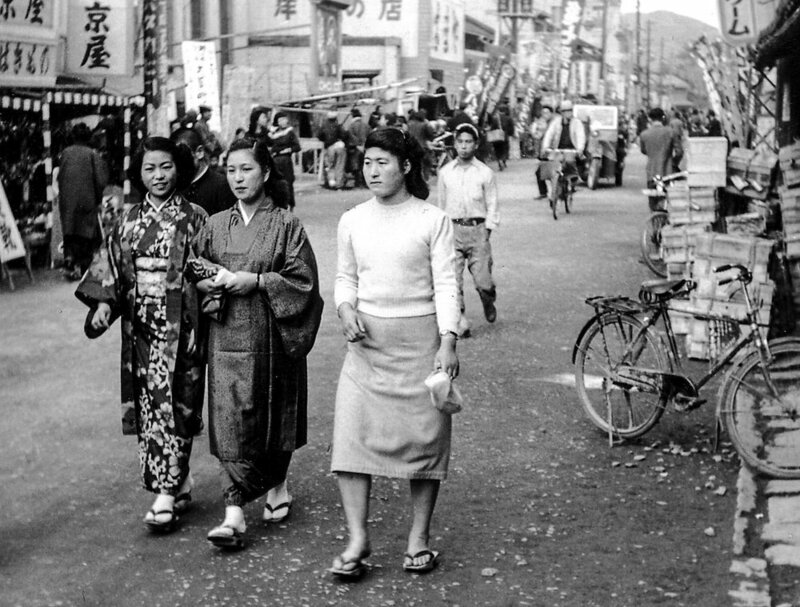 The models in these successive shots are women glimpsed in the streets of Ishinomaki. Amongst them are a young woman, a lady with her child, and some sisters. It seems that Captain Butler, who visited many places, noticed the different appearance and clothes of women in various areas (urban districts, farming villages, and fishing villages), industries, and occupations. Most men wore western clothes, but women mixed Japanese and Western clothes. The three good friends that can be seen [in this photo] if they are still alive would be in the latter half of their eighties, wouldn’t they? The woman with the white sweater and skirt has good taste, but it’s a pity that she is wearing geta (traditional wooden Japanese clogs). This was a year when nylon socks were in vogue, but throughout the country everything was in short supply so shoes were a valuable. It was a time when even though people wanted things they just could not get their hands on them. This photo is one view of the 1951 (Showa 26) Ishinomaki Kawahiraki Festival [a festival that marks the start of boating season] which was held on July 28th and 29th (Sat.). Having been stopped since the outbreak of the Second Sino-Japanese War in 1937 (Showa 12), the Kawahiraki Festival was revived in 1946 (Showa 21) after the Pacific War. Based on the simple Tanabata Star Festival decorations on Tachimachidori Street and the back road leading to Toriya Shrine which is in front of the stone torii gate (which was damaged by an earthquake in the sea off of the coast of the Miyagi prefecture and moved to the grounds of Toriya Shrine) we know that this was one of the Kawahiraki Festival days. On this day the one-way Tachimachidori Street had been blocked off to cars. Without expecting streamers or kusudama (decorative paper balls used during festivals, etc.) like the ones on Omachidori Street, a tunnel made of colored paper strung from small bamboo plants was the best they could do. With the modest, small bamboo plants, it was a time when [everyone] felt the joys of festivals and peace. Below the 200+ stone steps the road from the old Kyuoikawanaika internist to the old Kyunakajimageka surgeon is unclear, but it had already been built. The Tachimachi shops from the left are Fukuraikanshashinkan photo studio, several houses down between the reopened Taigetsushokudo restaurant and the red and white curtain of the Western building is a roof (a gateway?) to the entrance of Fukichodori Street. To the right of that is the Akitaya mansion and the large ginkgo tree in the gardens, several storehouses, and Miyoshi Shrine. to the right behind Akitaya is Shindencho’s Kinkabuto, Suzukishoyuya soy sauce shop, and Suminoe sake brewery, etc. There are two festival performance tents standing in the remains of Akitakoen Park in front of Fukicho, and beginning in May of this year the Kigura Circus was performing. Aren’t there several people who remember the crowded circus tents on that festival day? Several years later the remains of Akitakoen Park were sold off and it changed into the Ekimae Market, but there are now few left of the generation that knows of the market. It is thought that at the upper end [of the photograph] are Ogawa railroad crossing and the northern end of Asahimachidori Street. To the left of the Asahimachi railroad crossing can be seen the Takayashikido Road which runs along the Hebitahori trench. Before long, around 1955 (Showa 30), the adjustment of arable land behind the station was completed and the Hebitahori trench was made into a straight line near the Ishinomaki Line. In this year the North-South road of the Mizuoshi railroad crossing in front of the Niinumakanamonoya hardware store in Kokucho was put in place. [This photo is of] Ishinomaki’s iconic shopping district’s Naikaibashidori Street and Omachidori Street stoplight (current day Aitopia). It’s a color photo taken from the Naikaibashi Bridge side [of the stoplight], revealing the area beyond Omachidori Street all the way down to Hashidori 3-Chome. Lined up from the right are Shosendo, Takahikokutsuten shoe store, Kashiwayagofukuten Japanese cloth store, Yoshokushinsekai Western food store, Hiramashoten, and Endoyohinten Western goods store (though not pictured, Hoshiyakkyoku drug store is also there). We can see a dome-roofed concrete structure (formerly the Miyagi Shogyoginko Commercial Bank, owned by Shichi-Ju-Shichiginko Bank), currently the Ishinomaki Chamber of Commerce and Industry, the sign for Heiwadokashiten sweets shop facing the road, the pole and neon sign of Hashidori Shopping District facing the Hashidori entrance, and the circular roadside lights in the shape of tendon lures suspended in air above the road as far as 3-Chome. The white characters reading ‘tobacco’ on Shosendo’s red sign are nostalgic. The only people who would recognize the three-wheeled vehicle on the left side [of the photo] are elderly people. The make and model are unknown, but three-wheelers gave off a great amount of exhaust. In 1951 (Showa 26) there were 469 units [registered] in the Ishinomaki police jurisdiction. In an age when four-wheeled automobiles were rare, many three-wheelers played an important role. They cannot be seen in the photo, but on the North side of the corner of Naikaibashidori Street and Nakamachidori Street are the Shikurayakkyoku drug store, Takahashisobaya soba shop, Itabashizakkaten general goods store, Summit, etc. In the South corner are Hokodo, Tengudo, Mamushiya, Chukaro, Taizanso (afterwards the Marumitsu Ishinomakiten shop, which opened in 1955), Kashiwayohinten Western goods store, Tachibanagofukuten Japanese cloth store, Wakazukikesshoten beauty store, etc. The Taisho period (1912-1926) former Miyagi Shogyoginko Commercial Bank was demolished after [the photo was taken] in 1955 (Showa 30) and rebuilt as the Shichi-ju-Shichiginko Bank Ishinomaki Branch. After the Shichi-ju-Shichiginko Bank Ishinomaki Branch moved to Tachimachidori Street it was used as the City Social Welfare Building. In the 40’s with the advent of the automobile society, widening of Naikaibashidori Street, the modernization of the shops, and the enforcement of pedestrian precincts and night stalls, it was developed to be the greatest shopping district in the city. 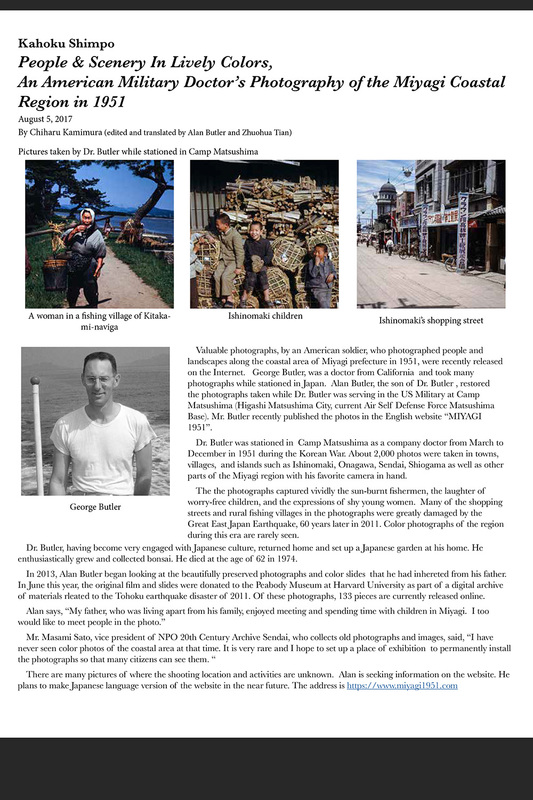 This is a serial commentary, posted weekly on Sundays, by local historian Seiji Henmi on the pictures taken by the late American military doctor George Butler in 1951 of the Ishinomaki region. 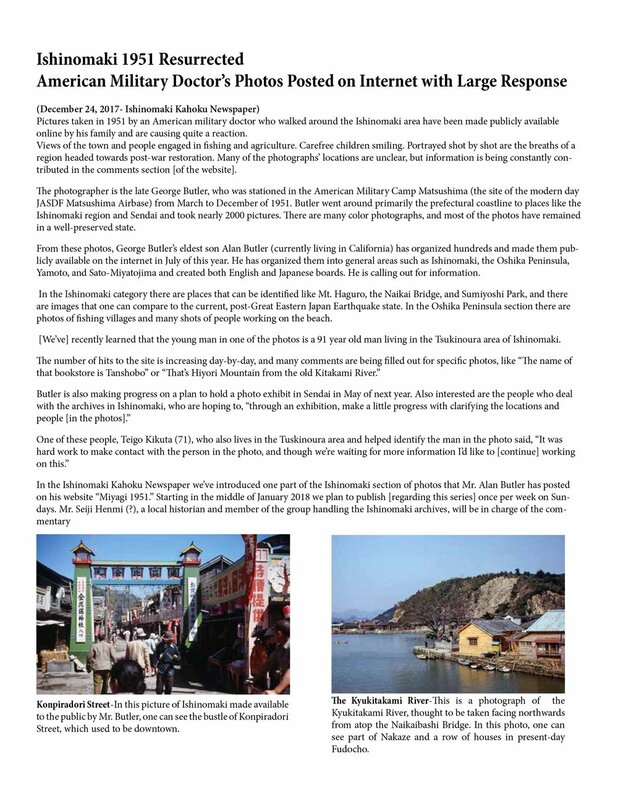 Please address any information regarding the photos to Mr. Seiji Henmi at 090(4317)7706. Seiji Henmi was born in the middle of the City of Ishinomaki in December of 1947. He graduated from Ishinomaki Senior High School and the Tohoku Gakuin University Economics Department. He worked for the Sankei Newspaper in the Ishinomaki section, and after retiring worked on investigations regarding the Kitakami River for the Foundation of River and Basin Integrated Communications, JAPAN. He is now working for the Ministry of Land, Infrastructure, and Transport Kitakami-Karyu River Office’s Mizubenofukko Mirainokan Hall (Waterfront Restoration and Future Hall) (located in Nakase, Ishinomaki). He is currently living in Ishinomaki’s Chuo 3-Chome.